One of the earliest features of Helix, the Quick Query has remained unchanged in function since its inception. The original Helix interface used a set of three radio buttons or checkboxes to provide a limited set of query options, as seen in the first image on the right. Due to the interface it was always impractical to expand this set of options, and the checkboxes used to allow additional numeric queries were confusing to some users. In Helix 6 — the second image on the right — this interface changed, using the macOS standard search field with a magnifying glass and popup menu to choose the search option. This opened the door for additional search options, but was not expanded in order to maintain Classic compatibility. In the case of the numeric query, where there were three checkboxes (that could be clicked in combination in ways that confused a non-insignificant number of Helix users) additional lines were added to the popup, one for each possible checkbox combination. 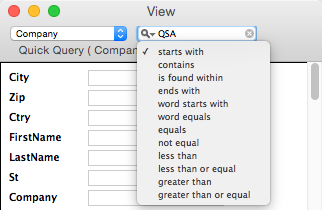 Helix 7.0 expands the Quick Query options to include every two-part* query option available in Helix. This is a natural evolution, since the Quick Query is simply a different interface for building an abacus query that uses as single tile, as most collection designers will recognize, upon reflection. *A two-part query is one that takes a field and a single input value. This excludes the single-socket tiles Defined ◼, Undefined ◼ & Unique ◼ since they contain only a field and not an input value, and the three-socket tiles such as ◼ ≤ ◼ ≤ ◼ that require two field inputs. This also includes the ◼ Word Starts With ◼ & ◼ Word Equals ◼ tiles, even for non-keyword text and styled text fields. This is in keeping with the removal of that restriction when creating other types of queries. Active Quick Queries are automatically updated to retain their current query and to support the additional options when updated to Helix 7.0. This table summarizes the additional Quick Query options available in Helix 7.0. Empty cells indicate non-applicable query options.